The current owners, Giannis and Despina have transformed it into an opulent hotel, taking care to maintain and take advantage of its captivating beauty and bracing magnetism, which draws from its foundations of charming traditional Cretan stone, while fully respecting the nature and history of the surrounding area. The restoration of the building was made with natural stone created entirely in the limestone area. This is used on all surfaces in the hotel, both visible and concealed, even in the coping around the swimming pool. 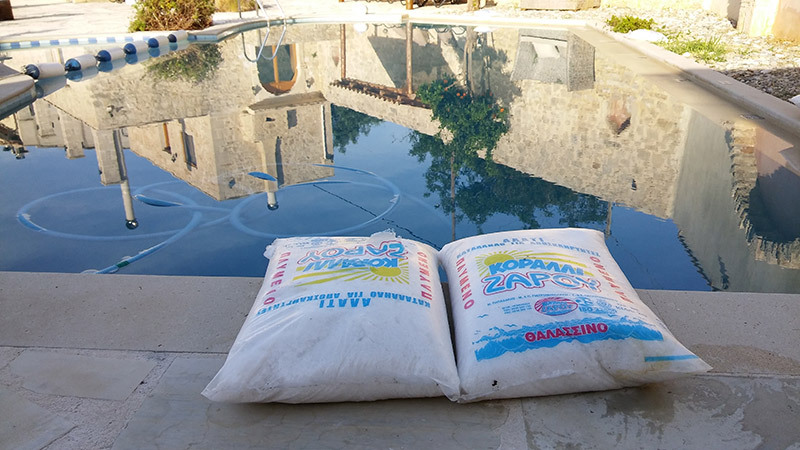 Volcanic earth from the island of Santorini was used back then, as it is today, for grouting and coatings replacing cement to create an ecological dwelling: warm in winter and cool in summer! The seawater has emollient properties so that the skin and hair retain their smooth texture and do not become dry and brittle as happens when using chlorine. Another very important factor is that when the water passes through the electrodes, chloramines (‘dead chlorine’ which causes the chlorine smell and stinging eyes) are destroyed, leaving the water fresh and healthy, and ideal for children. Heat pumps absorb heat energy present in the atmosphere (aerothermal) and produce hot or cold water for cooling or heating buildings and hot water so with much less power consumption protects the environment! In addition to pecific ecological water unit FUN COIL cooling and heating together offers a pleasant environment during your stay! © 2019 - Spandidakis family. All Rights Reserved.